Garage door springs can pose a great danger. Keeping them safe can turn out to be not such an easy task though. Their safety requires a lot of attention to detail and regular maintenance of the garage door. Safety cables are a great invention in this regard as they prevent the springs from totally breaking off and harming the surroundings. It never hurts to have extra safety features in the garage, especially considering that replacing a windshield can cost 4-5 times as much as having the safety cables installed on the springs. They are very similar to garage door cables, but lighter. They are usually attached to a stationery object like a wall, need to lace through the spring and most importantly be attached to the same support as the springs themselves. This will ensure their working condition for a longer time period. While the installation of the cables is not actually a hard task, it requires a lot of professional tools. This is why we advise that you use our specialist's help for it. Hiring a professional for the job, you can be sure it won't take him as long to install a pair. The process requires putting the cables through the springs and latching them onto the stable holders. 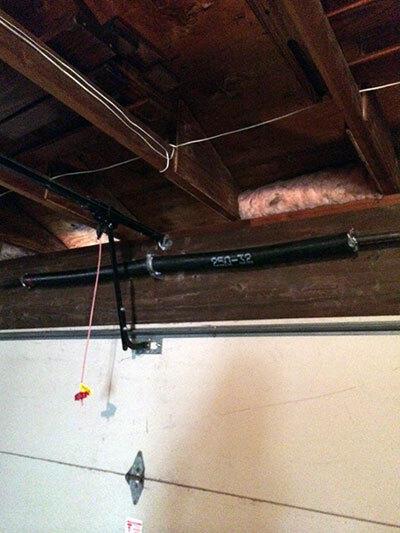 It is in the owner’s interest to do the task with the garage door open, to pose less tension on the springs.